The most important impact of the crisis facing Toshiba and Westinghouse is the chilling effect it will have ‒ and is already having ‒ on the nuclear power industry. The nuclear power crisis escalated dramatically on March 29 with the announcement that US nuclear giant Westinghouse, a subsidiary of Japanese conglomerate Toshiba, had filed for Chapter 11 bankruptcy protection. The filing marks the start of lengthy and complex negotiations with creditors and customers and the US and Japanese governments. The companies are in crisis because of massive cost overruns building four AP1000 nuclear power reactors in the southern US states of Georgia and South Carolina. The combined cost overruns for the four reactors amount to about US$11.2bn and counting. Stephen Byrd from Morgan Stanley said that the cost of the plants, if completed, will be about twice Westinghouse’s original estimate. The crisis escalated again on April 11 when Toshiba released unaudited financial figures and noted in its financial statementthat there is “substantial doubt about the Company’s ability to continue as a going concern”. Toshiba reported a net loss of US$5.9bn for the Oct.‒Dec. 2016 quarter, mainly because of a US$6.3bn writedown on Westinghouse. Equity stood at negative US$5.7bn as of 31 March 2017. Adding to the drama, auditor PricewaterhouseCoopers did not endorse the April 11 financial statement and instead submitted a statement emphasising the risks to Toshiba’s future. Toshiba had already twice delayed release of its financial figures, and released unaudited figures on April 11 in the hope of avoiding a stock exchange delisting that would worsen the crisis engulfing the firm, increasing financing costs and exposing it to further lawsuits from shareholders. But all that can be said about the release of hideous figures, accompanied by a disclaimer from the auditor, is that it was the least-worst of Toshiba’s options. The company still risks being delisted. Toshiba was already sitting in the fiscal naughty chair, its shares designated “securities on alert” due to a profit-padding accounting scandal from 2008‒2014 that was revealed in 2015. Toshiba will still be liable for existing cost overruns with the four AP1000 reactors in the US but the bankruptcy filing may limit its liability for future cost overruns. Thus Toshiba has somewhat reduced the likelihood of facing bankruptcy itself … by throwing Westinghouse under a bus. The bankruptcy filing bodes poorly for Westinghouse and the AP1000 projects in Georgia and South Carolina ‒ the future of the company and its reactor projects are in doubt. Even if Toshiba and Westinghouse survive the unfolding crisis, some of their reactor projects and plans will not. Four AP1000 reactors under construction in China will likely be completed, but plans for more AP1000 reactors in China seem unlikely to progress, and plans for 6‒12 AP1000 reactors in India will likely be shelved. Toshiba has tried but failed to sell Westinghouse several times already so must instead sell off profitable parts of its operations ‒ including its highly-profitable memory chip business ‒ to stave off bankruptcy. Incredibly, Toshiba chief executive Satoshi Tsunakawa said in mid-March that Toshiba might have to pay a buyer to take Westinghouse off its hands. So Friends of the Earth could take control of Westinghouse and use the accompanying payment to turn it into a renewable energy start-up or a karaoke bar franchise? Perhaps, but anyone willing to take Westinghouse off Toshiba’s hands would presumably also be taking on a debt load as well as future risks associated with company’s nuclear business. Meanwhile, French company Engie has exercised its right to sell its 40% stake in NuGen to Toshiba. NuGen is the consortium which hoped to build three AP1000 reactors at Moorside, near Sellafield, in the UK. Toshiba wanted to sell its 60% stake in NuGen, and now wants to sell its 100% stake. Much more detail could be provided about the possibly fatal problems facing Toshiba and Westinghouse, but let’s instead put the issues into context. Beyond the direct impact of the unfolding crisis on numerous reactor projects around the world, the most important impact of the crisis is the chilling effect it will have ‒ and is already having ‒ on the nuclear power industry. The AP1000 fiasco in the US shows that industry giants can be brought to their knees by cost overruns on just a few reactors. Further confirmation comes from two French EPR reactors under construction in France and Finland: combined cost overruns amount to at least US$13.5bn and counting, and French utilities EDF and Areva would both be bankrupt if not for repeated multi-billion-dollar government bailouts. Governments, energy utilities and companies, banks, and investors will be considerably less likely to gamble on nuclear power in light of recent events. Not many energy utilities and companies are as large, and as capable of absorbing debt, as Toshiba and Westinghouse. And few are as experienced: Toshiba has built 20 reactors in Japan (some in joint ventures), and Westinghouse has built 91 reactors globally. Yet cost overruns on four conventional reactors have brought these industry giants to their knees. The French Liberation newspaper said on March 29 that the Toshiba / Westinghouse crisis, and the huge problems facing French utilities EDF and Areva, forebode a lasting “nuclear winter”. Ted Norhaus from the Breakthrough Institute, a pro-nuclear lobby group, wrote on March 27 about his ideas to forge “a globally competitive advanced nuclear sector … from the ashes of today’s dying industry”. His innovative, ecomodernist proposal is to supersize taxpayer subsidies to the nuclear industry, combined with some Silicon Valley-inspired tish and fipsy about “radically reorganizing the nuclear sector” to facilitate “bottom-up innovation, led by start-ups, not large incumbents”. Recent articles from the Breakthrough Institute and other nuclear lobby groups have warned of nuclear power’s “rapidly accelerating crisis“, a “crisis that threatens the death of nuclear energy in the West“, “the crisis that the nuclear industry is presently facing in developed countries“, and noted that “the industry is on life support in the United States and other developed economies“. Of course those lobbyists are dramatising the situation to highlight the importance and urgency of supersizing taxpayer subsidies to the nuclear industry. 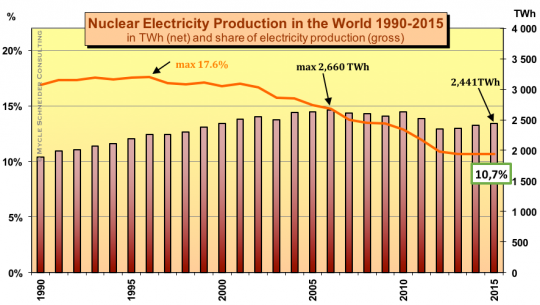 If the nuclear power industry is dying, or if it is dying in the West, that will take some decades to play out. Nonetheless, nuclear power growth can be confidently ruled out in the US, Japan, across EU countries combined, and in numerous other countries for the foreseeable future … not to mention the 160+ countries that are nuclear-free and plan to stay that way. The industry is downsizing and the recent Toshiba / Westinghouse crisis is the sort of convulsion that inevitably attends an industry-wide downsizing. Smart money has already walked: the UK Nuclear Free Local Authorities noted on April 4 that seven energy utilities and companies have abandoned plans to build new reactors in the UK over the past decade. 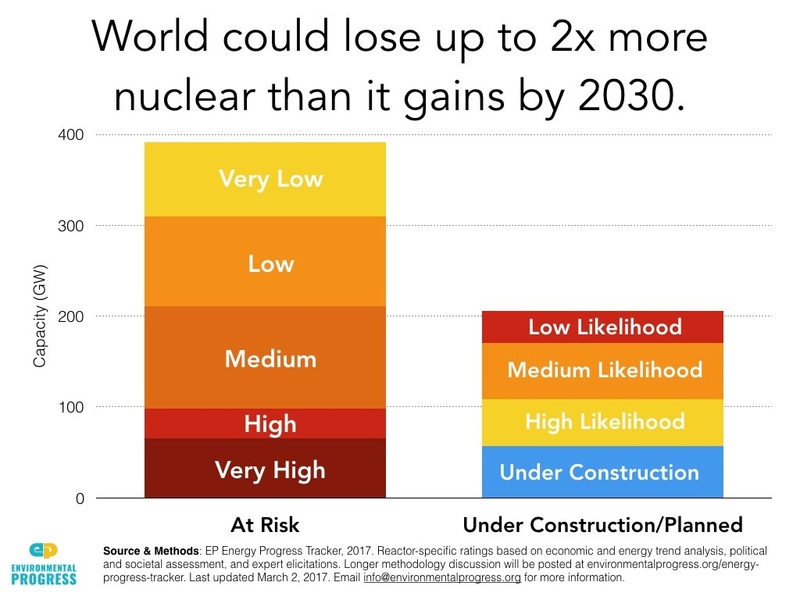 The nuclear industry may or may not be dying, but it is certainly in deep trouble and downsizing. After a growth spurt followed by 20 years of stagnation, nuclear power is approaching the Era of Nuclear Decommissioning (END) and recent events tend to confirm that the industry is indeed at the beginning of the END. Dr Jim Green is the national nuclear campaigner with Friends of the Earth Australia and editor of the Nuclear Monitor newsletter produced by the World Information Service on Energy. I have little sympathy for all the people who profited from nuclear power energy generation – the corporations, the stockholders,etc. It was based on the extraordinary subsidies of the war investments and continually supported by the war departments. Initially it was a good idea BUT it went on for far too long – blind Freddy could see that nuclear was a huge Faustian bargain that should never have been entered into eg after Chenobyl. I totally agree. The next step should be to campaign for using the remaining wealth in these companies to clean up ALL of the messes left since the beginning of the Manhattan project, instead of abandoning it to poison humans, animals and plants for eons. It will be the fossil fuel companies next. If you are in fossil or have fund attachments. Do yourself and the planet a favor. Get out now!! Funny, I thought mitigation of climate change might a higher priority? Road kill from disruptive technology. RIP… hopefully to never awaken. Then explain to me one thing. How on earth can it be possible that the dead, dying, dead industry has completed 46 reactors between 2010-now. 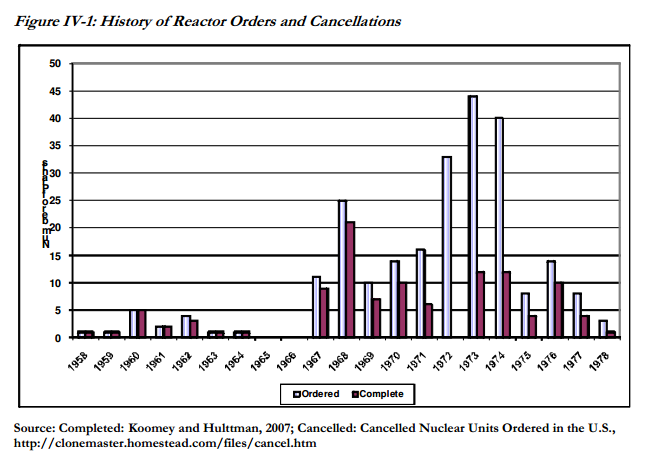 Just as reference when the industry was alive and well they only completed 32 new reactors between 2000-2009. The last two years 20 reactors have been completed, the same rate was last seen in the late 80’s. Pretty strange wouldn’t you say?. This year 10-18 reactors are expected to come online, not really the mark of a dying industry now is it? Even if only 10 new reactors are completed the dead industry has built more nuclear than between 1990-1999 (56 reactors) . And what of the government subsidies involved? The main effect of the Trump Presidency will be the $US’s loss of reserve status. That’s when all those subsidies will be shown up in stark relief..
How do you explain ongoing build, deceptive marketing and massive government subsidies. Take the VC Summer plant, originally forecast to cost ~$13 billion now already at $21 billion less than halfway through construction, almost certainly going to end up costing over twice its original quoted price by the time construction is complete several years late. Those enormous cost over runs are government and utility customer subsidized. The economics of these plants look pretty good when they are routinely quoted at 50% of their actual cost however the industries manipulative tactics are now on full display and after the current crop of plants are either abandoned or complete watch for new orders to dry up. Then explain to me why KEPCO is building 4 APR 1400 1400MW plants in the UAE for 5 billion a pop with a constrction time of 4 years? Unit 1 began in 2012 and has now completed testing and is waiting for fuel loading permission and is expcected to reach criticality in May. Tianwan 3 built By Rosatom in China. That one Began constrction in China December 2012 and is now completing its hot tests and is going to go critical by the end of the year. Hongyanhe 5 in China. March 2015 they began construction and now all major civil engineering is done. That one wa built by CGN. 3 different companies and yet they manage to construct on time and on budget. Imagine for a second a solar installation company offered to install 5kw solar systems in 4 weeks or less for $5,000 then routinely took 2-3 months to install and charged customers $10,000. That is how nuclear installation companies are routinely operating in recent years and they deserve the panning hey are getting. Yeh never mind a safe climate. We must prevent all nuclear R&D huh? So Max please feel free to share your plan to reduce atmospheric CO2 to <350ppm this century. Cheers. I should have been more explicit… hopefully to never awaken in its current state. I am all for R&D and progress in a more efficient generation and use of energy. However, the current state of play in the western world, and in particular the imperialistic policy of the US, there will be other problems to be solved first, otherwise climate deniers will continue to run industries for profit without any regard for the people and the planet. I often wonder in this case if the end justifies the means; that is whether the nuclear industry could satisfy the political right’s priorities, and provide us with the radical emission reductions we need? Can of worms? The problem sits far deeper, which I have tried to explain in other posts in this forum. When you look at the current state, coal is the hype, due to lobbyists, and elsewhere nuclear is the hype. In both cases it is corporate lobbyism that pushes for an idea or solution that maximises their profit taking — nothing else matters. Have you ever seen mine rehabilitation by the corporations which ran the mine? No. The public pays! (What I refer to as: “privatise profits, publicise cost”.) The minute the state pays a subsidy or funds any clean-up it is tax payers money (and mind you corporations hardly pay any tax) who pick up the bill. The current system is insane and has no future. CO2 may be a laudable issue, but there is resource depletion at all levels (soil, fish, fossil fuels), add the numerous environmental issues, and then look at the current incumbent governments (in recent times deniers of everything that hinders profit and the secures established corporate interests), one has to be completely naive to see a better (or improving) future. For the sake of the planet and all living beings, I hope that humans go extinct for good — as is scientiffically being predicted if we continue on the path we are on. We’re embedded (imprisoned?) within capitalism. Therefore expensive infrastructure projects will always involve lobbying, whether they be highways, nuclear energy or even carbon sequestration on the scale that’s now needed. Whether our economies can be transformed to be compatible with a safe climate at such a late stage is certainly looking tenuous. It’s worrying to see people here hoping for the demise of nuclear energy. They seem ignorant of how late the hour is for mitigation of warming and the severity of impacts just around the corner (just like most coalition voters). The impacts of a 3C+ world are infinitely worse than the consequences of a highly nuclear dependant one. Sure there’s wind, solar, tidal, biomass, geothermal etc energy but will someone vehemently anti-nuclear please provide a reference to a single published study that describes how we limit warming without partly relying on nuclear energy? I’d like to read it. We are certainly going about it the right way! More likely than going totally extinct will be a return to a few milllion hunter-gatherers. We may overshoot any age of empire because of the results of resource depletion and severe global warming rendering agriculture un-workable in the face of droughts, floods and super storms. There’s much to look forward to and none of it good, but we continue to perfectly track the ‘standard run’ collapse scenario described in the 1972 report, the Limits to Growth. Power from nuclear fusion, as collected by solar panels on my roof, with variability managed by billions of internet connected loads. Your children can explain the internet to you. Now use that particular form of cherry picked energy to rapidly decarbonise the activities of our entire species. Or what the hell, at least reference a study proposing that. You owe to your children AT LEAST a single reference. You implicitly assume that nuclear is the only way to decarbonise. The reality is that renewables are now cheaper and can be built faster. They also do not leave radioactive waste for the next hunderd thousand years or so. Well Hans, where’s your reference to a published study demonstrating what you propose can be achieved? Or do yo plan to just wing it? That’d be brave. The formulation of your literature references request is a bit vague . So let me so free to reformulate it as: Is there any scientific literature that shows that renewable energies can contribute to reducing CO2 emissions? – Are there enough solar, wind, hydro and biomass recources? – Is it economically feasible, i.e. are the costs acceptable. – Do renewables really deliver more energy than they cost to produce? 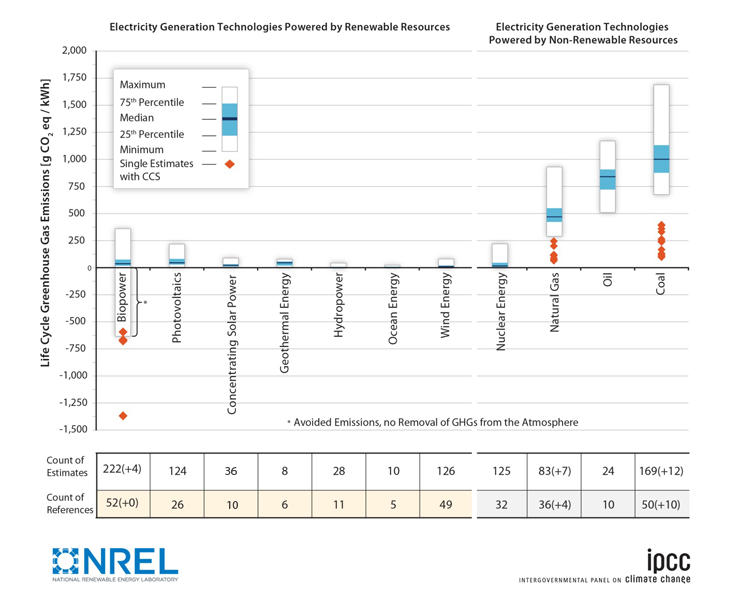 – How much variable renewables can be integrated into the grid? – Can transport and heating be electrified? By the way what is your reference for nuclear? Good God Hans. Have you been hiding under a rock? Are you honestly requesting me to provide you with a reference to a study that includes nuclear in a future energy mix that limits warming? The list is long. Or any by Hansen where he discusses the topic. What I am requesting from you is a study that describes a future energy mix that limits warming and excludes nuclear. Please. If there isn’t one, then maybe, just maybe, there’s a reason for that. You could start with the first study (of which I’m aware). Jacobson and Delucchi (2009) in which they laid out a blueprint for getting all the world’s energy from renewables getting there over a 20 year period. Or if you want something more detailed and recent you could look at the Solutions Project which has done an analysis of the best mix of renewables for each of the 50 US states and most of the world’s countries. Do remember, the mix suggested today will probably be somewhat different from the mix we end up with. Technologies change at different rates. Costs for some technologies fall faster than for others. What will likely happen, is happening, is that utilities are buying what works best right now to save them fuel costs for fossil fuel plants. Later on they’ll be looking at filling the last niches. Will it be overbuilding the cheapest sources or adding more storage or something else that might evolve over the next couple of decades. Nuclear could be part of the mix and will be part of the mix for awhile. But the cost of new nuclear is very high and showing no signs of falling. The price of wind and solar have become just plain cheap and are getting moreso. I’d be very surprised if wind and solar don’t end up supplying 60% to 80% of our energy needs. And most likely closer to 80%. Then the authors only discuss replacing the existing electrical power consumption and ignore accounting for current consumption of liquid fuels. Your second reference is odd. If you lick on International, it states “Renewable energy sources represent the percent of 2050 all-purpose end-use power in the country that is delivered by the given energy technology.” Are they again only discussing electrical mains/grid energy and ignoring all other aspects of our economy? They don’t say. Lots of smiling faces though. We need to radically decarbonise globally not only existing electrical consumption but also transport, land freight, sea freight, air freight, travel, industry and agriculture. Does anyone have a single published scientific study of managing this by excluding nuclear? Our return to a safe climate demands everything is thrown at this problem urgently. We can no longer afford the luxury of excluding technologies. Right after that they discuss the total amount of energy that should be needed. They remove the amount of primary energy now lost when we burn fossil fuels and turn over half of the energy into unused heat. 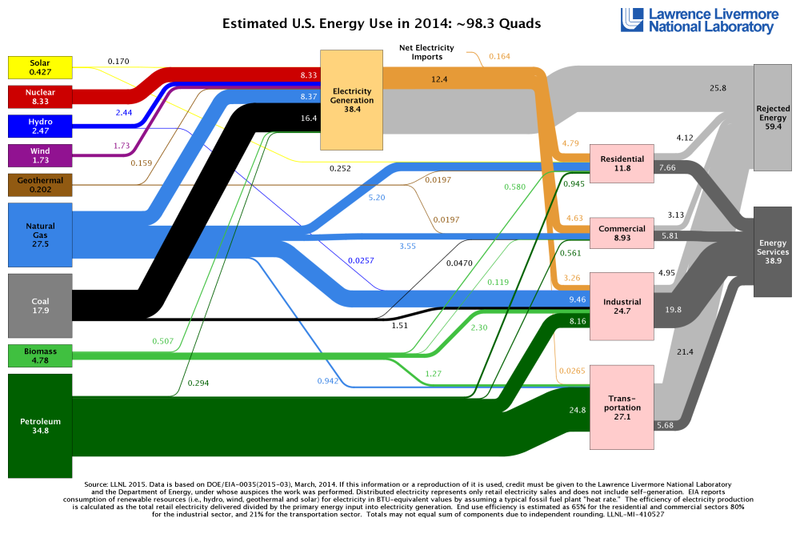 Take a look at how inefficient a largely fossil fuel based system works in the US. Of all the primary energy (oil, coal, water, sunshine, uranium) 38.9% did something useful and 59.4% just dissipated as useless heat. From there on they talk about the electricity we will need. Do remember, this was 2009. Mark and Mark don’t have a good non-fossil fuel option for airplanes. And we haven’t yet cracked that nut. The Hyperloop might reduce our need (and desire) to fly by 75% or more. The remaining flying might need biofuels or synfuel. Second link – Solutions Project. Again, they’ve factored out the lost energy in fossil fuel use. They created a mix based on “end-use” as opposed to primary energy. An aside. There will be some energy waste in an all (or almost all) electric world. Battery charging is not 100% efficient. Moving stuff encounters some friction. With EVs, IIRC, we lose about 10% of the used electricity due to battery heating and about 10% of the battery energy via various friction losses in the powertrain. Shane, It would be nice if you could control your emotions a bit and remain civil. I thought you where looking for a paper that discusses all aspects of feasibility of renewables plus the effects on the climate. My point was that such a paper does not exist, neither for renewables nor nuclear. Turns out you just wanted an IPCC scenario with only renewables (knowing beforehand that it did not exist). And indeed the van Vuuren paper does not discuss all aspects of feasibility of either technology. For example, there is nothing about nuclear waste in the paper. The reason that there is currently no IPCC scenario with only renewables is simple: the last IPCC assessment is already quite old and developments on the renewable energy front have been going fast. For example, one of the papers underlying the RCP2.6 scenario is de Vries et al . It is interesting to look at Table 3 in this paper. 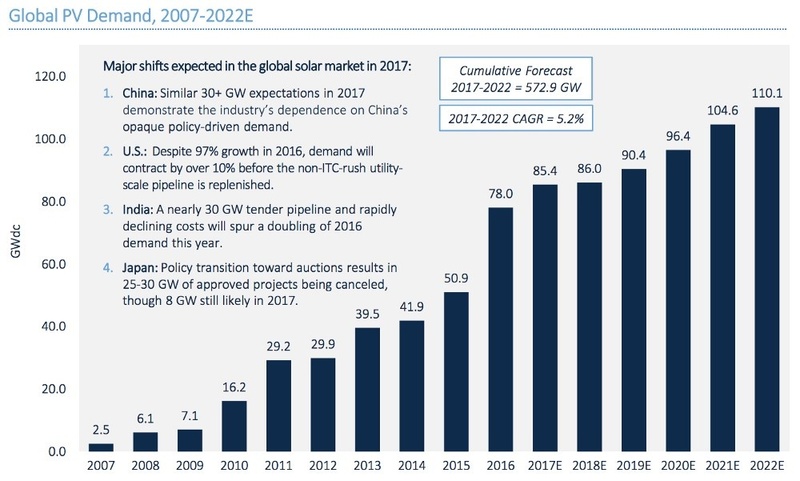 The price range projected for PV in 2050 is already reached today! For the climate it does not matter so much if power is produced by nuclear or wind or solar so it is enough to prove that there is enough technical and economical potential for wind and solar power to also replace the nuclear part of RCP2.6. OK maybe add a generous 15-20% for the difference in EROEI. In the van Vuuren paper in 2050 147 EJ is provided by nuclear and 188 by renewables (defined as wind solar hydro). So it is enough to prove that 1.2*147EJ+188EJ=364.4 EJ can be provided by wind solar and hydro by 2050. I will add some relevant literature references later on. I knew beforehand a scenario relying only on renewables didn’t exist? Yes I stated that. The PV price range quoted in Vries is lower than now? Table 3 shows $0.25-$0.4 in 2010-2020, $0.15-$0.3 in 2030 and $0.06 to $0.25 in 2050. If you think this significantly compromises RCP2.6, then email Detlef van Vuuren with your concerns. I consider it more sensible to instead be worried about the RCP’s dependance on BECCS and what’s currently changing in the planet’s cryosphere and oceans. Again, I’d speak with van Vuuren for an explanation as to why nuclear is included in the RCP. My guesses would be that nuclear power wouldn’t simply be decommissioned. This website seems very “anti-nuke”. Perhaps those with this concern should objectively explore reasons for the inclusion of nuclear energy in grids. Play the “devil’s” advocate instead of pushing solar and wind? Given our dependance now on carbon dioxide removal, on scales rivalling that of the world’s oceans, combined with emission reduction rates without historic precedent, there’s no time left to bicker over technologies. Soon the window of opportunity for 2C will be shut. We’re committed to 1.5C now, which is expected to arrive around 2025-30. I sometimes wonder if we were to create a 4C fossil fuelled world whether anyone would be glad that at least we didn’t rapidly expand nuclear. It’s only CO2, it’s not like it’s nuclear radiation. Nuclear has been dead for quite a while, zombies propped up by subsidies but with no possible positive outlook. Amazing how long people can turn a blind eye to obvious facts. Hmm nope, last 2 years 20 reactors have been completed and this year 10-18 more are expected to come online. That means that they will build 30-38 reactors in three years. Just as a reference between 2000-2009 the alive and well industry completed 32 new plants. The dead industry having its most productive period in almost 30 years, strange wouldn’t you say? It is only a matter of time until China stops nuclear too. It is just not competitive. Hard to see that happening with the pollution problem China is having, they need everything. They also build nuclear on time and on budget. 3 Billion US a pop, they are doing he same with nuclear as they are with solar. Also this year China will start Phase 2 of their nuclear build and start work on 8 new reactors this year alone. “. Six Chinese-designed 1000 MW reactors at Yangjiang will be a huge nuclear power base for China General Nuclear, and will cost only US$11.5 billion for over 6000 MWe, a third of the cost in western countries.” Unit 4 was connected to the grid in January and is the first reactor to be completed that started construction after Fukushima. You are aware that in China chemical industrial districts go up in explosions from time to time? And that in 2008 over 70.000 (!) people died in an earthquake because they cheated on buildings codes? It is only a matter of time until a nuclear plant goes up there. They only had a chance of getting build in the first place because in China public opinion and civil lives don’t matter that much and money comes from the government. Almost 20 000 people died in japan during the 2011 earthquake but still the radiation related daeths from Fukushima are at zero. True that Chinese industry has pollution problem but this extends to even solar power that even Greenpeace got upset about it a few years back when solar companies were dumping heavy metals into the river. Where is the outrage from that? As for power production and accidents lets not forget that the Banqiao collapsed in 1975 killing 171 000 people by far the worst power production related accident ever. Also lets not forget that China’s massive hydro porjects have requirered the relocation of over a million people and no one seems to be upset about that either. The Thyroid “cluster” is actually a result of over screening and over diagnosing the cases. Oh Btw none has died of thyroid cancer there, find me a dead person and we will continue. Secondly I asked Greenpeace about this and offered to make a donation 100 dollars for every person that died due to the radiation from Fukushima. Greenpeace refused to provide any information. Can you tell me why this is the case? This game has been played for decades, only because it is very hard or next to impossible to link a certain cancer case to radioactivity, it is also certain that exposure to radioactivity causes cancer with probability rising with the dosage level. It is a lying game to fool the weak-minded, nothing else, and in Fukushima it is just the latest installment of this game to not admit to any responsiblity for dying children as this really reflects badly on the government. But we don’t even need to have the health and responsibility discussion, nuclear is not and will never ever be competive to renewables again, even with storage, so all there is left to do is watching it slowly die, as it already does in the west and Japan and will surely do in China, too. If renewables are so cheap, one could say too cheap to meter. Why does europes renewable powerhouses ie Germany and Denmark have the most expensive consumer electricity? Also why do these countries have such a high carbon output/kwh electricity? Also then explain to me why has Renewable investment dropped across the board for a few years now? They said the same about about wind energy last year, well 9GW less installed even though we were promised more bang for our bucks. That still brings us back to the original point. The dead industry is on track to build more new nuclear in over 20 years, even though it is supposed to be dead and buried. Then Again Westinghouse and Areva didn’t actually build anything this decade, now the prevoius one but they are the nuclear industry. So yeah explain how can the industry have its most productive period in over 20 years and yet be dead at the same time? Taxes. Their wholesale prices (cost of generation) is low. Germany produces electricity for less than France. Because the price of wind and solar has been plummeting. More wind and solar are being installed each year while the overall cost of installing more falls. The only significant reactor builds are where it is being done with government money. Nuclear is basically finished in the US and Europe. Aging out reactors won’t be replaced with new reactors. About 25% of US reactors are being closed because their operating costs are higher than wind, solar and natural gas. France is closing about one third of their reactors and replacing them with renewables because the cost of operating their reactors has become too expensive to bear. That still dosen’t explain why wind energy instalations went down by 9GW in 2016. Also Nuclear finished in europe? Hmm The UK, Hungary, Finland, Slovakia, Check Repblic, Poland, Belarus, Romania, Russia didn’t get that memo since they are all constructing new plants or have plans and tenders out for new plants. As for France the goverments own utility is publicly defying the goverments decision and also the French goverment is having a brexit moment with nuclear, ie they have no clue how they are going to do it in reality. Like Sweden that decided that they would get rid of nuclear by 1990 only to reverse that decision and then phse it out again only to reverse that decision again. To ad insult to injury Sweden’s wind sector is economically in the same state as Westinghouse about go belly up. 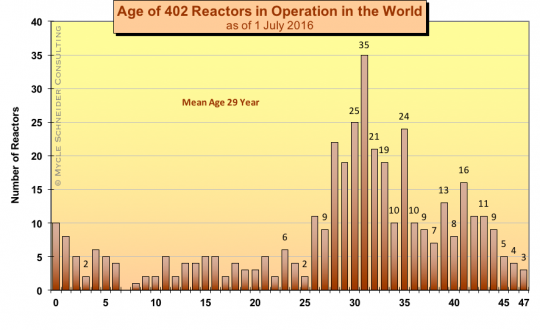 Still 46 new reactors in 7 years. 2000-2009 Only 32 new reactors, 8 of those were legacy projects, 7 in the former USSR and one in Brazil. So actually 24 “new” plants were built. 56 Between 1990-1999. That means that the dead dying dead industry is globally having its most productive period in over 20 years, not the mark of a dead industry now is it. For it to be dead it should not be building less than before, not more? Thats like saying the solar industry is dead, since they had a record year. Hows, btw, Yingli, Solarworld, Solar, City, Sun Edison, Vivint Solar and others doing financially? Installation rates are not constant year after year. The overall trend for wind and solar is up but sometimes we see large increases over the previous rate and sometimes we see decreases from the previous year. I think if you look deeper you will find that a large amount of the ‘noise’ in year to year wind installation comes from the way the US Congress has jacked around the subsidy program. Uncertainty has caused projects to be postponed or rushed to completion, depending on subsidy timelines. While wind was off in 2016 solar took a huge jump in the same period. Solar panel demand jumped 53% over 2015, the second highest year. Overall 2016 was the year in which more renewable capacity was added globally over all others. Watch to see how few of those plants are actually built. Russia will probably continue to build because in Russia, like China and North Korea, market forces play almost no role. Decisions are made by strong central governments. Many, many reactors have been planned over the years. Construction sometimes started. But they don’t come online. Right now there is serious consideration being given to abandoned the four partly constructed AP1000 reactors in the US following Toshiba’s bankruptcy problems. Hinkley is in no way a sure thing. I’d give it less than a 50% chance of going forward. The French nuclear industry is basically bankrupt. It’s only staying above water because the French government is the majority owner. As more and more offshore wind is made available in the UK it’s going to be harder to support building reactors and paying much larger fees for electricity. 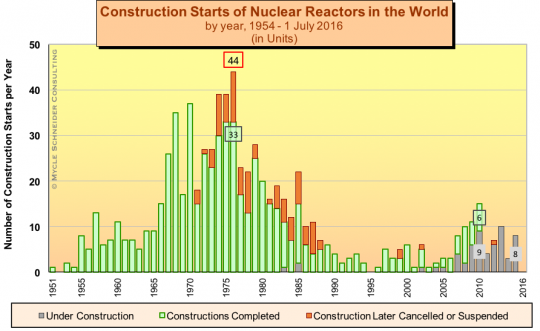 Look at the history of US reactor construction starts and completions. The nuclear industry has a long history of bidding low and then greatly increasing price over time. Once the final cost is understood many utilities have cut their loss and abandoned the project. That’s going on right now in the US as the projected cost of new reactors has ballooned during construction. The recently completed reactors which you have been celebrated are the results of projects commenced a decade or more earlier. It takes many years to build and certify a reactor and years of planning and design before that. Those reactors were agreed upon when wind and solar prices were multiples of what they are today. Ten, fifteen years ago no one was talking about wind and solar for less than $0.05/kWh, much less $0.02/kWh or less. Can you imagine a reason for someone to commit to a new reactor which would probably produce electricity for more than $0.10/kWh in 2017 when they could install renewables and produce electricity for half or less? There will be a few more reactor starts outside of Russia, China and North Korea. Some countries are run by stupid people who don’t keep up with facts. Some countries are very corrupt and very large projects provide lots of opportunity for collecting under the table money. A few reactors may be built as vanity projects, bragging rights. In countries with large nuclear industries there may be some institutional momentum that will carry their programs for a few more years. But overall nuclear is dead. It’s the economics. The big construction boom was prior to 1980. There was a very small boom in the early years of this century but it peaked in 2010 and has fizzled. Maximum nuclear capacity peaked in 2006 but maximum market share for nuclear peaked much earlier in 1996 as the electricity market continued to grow much faster than installed nuclear. Now we’re reaching the time when those pre-1980 reactors are starting to age out. Forty years is the design lifetime for many reactors. While some could be upgraded and run for another 20 years the cost of refurbishing generally would make the cost of electricity non-competitive. About 25% of the US fleet (and much of the French fleet) is not producing competitively priced electricity now. Spending significant money to extend their lifespan of the other 75% is often a deal killer. Take a look at US generation plant ages. That graph is from 2010, so add seven years to plant ages. The majority of US coal and nuclear plants are worn out or rapidly getting there. The average lifespan of nuclear and coal plants in the US is 40 years. Most plants will be older than 40 years a decade from now. We aren’t going to replace coal and nuclear with coal or nuclear. Makes no financial sense. Hey Stef, I found some more pictures for you to look at. As you can see a lot of reactors don’t make it to their 40th birthday. Those puppies are getting some grey in their muzzles. Just eyeballing it looks like well under 25% are less than 25 years old. Putting those two graphs together one suspects that nuclear’s role is going to be fading fast as we go forward. 46 reactors from 2000 to 2009 gets you all excited. That’s only five or so a year. We’re looking at years upcoming when we’re going to see multiples of that number closing. While there were reactors built from 2000 to 2009 they did not result in more reactors operating around the globe. They simply replaced (or almost replaced) reactors which were shut down. Peak number was 2002 and eyeballing the graph it looks like the number is down a few by 2010. Then following 2010 we see a drop in overall numbers. From the 2002 peak through 2016 we see an 8% drop in the number of reactors. According to the World Nuclear Association there were 60 reactors under construction or planned for construction in 2013. The total for reactors scheduled to close by the end of 2025 according to the World Nuclear Association in 2012 was 89. There are plants scheduled or likely to close which are not included in the 89 count. Adding in those reactors the number exceeds 100. Belgium 2 by 2015 and 5 more by 2025. Canada 4 by 2015, 10 by 2025 and 5 more by 2040. The Philippines is converting 1 reactor to natural gas. United States – interesting the World Nuclear Association fails to talk about planned US closures. The total for reactors scheduled to close by the end of 2025 according to the World Nuclear Association is 89 (2012). In 2012 about 25% of the 105 or so US reactors were reported to be in danger of closing due to their high operating expense creating an inability to compete in the market. Since then Kewaunee and Crystal River reactors have closed. Fort Calhoun is closing at the end of 2016. Fitzpatrick and Clinton are scheduled to close in 2017. Quad Cities is scheduled to close in 2018. Oyster Creek in scheduled to close in 2019. Pilgrim will close no later than 2019. Diablo Canyon’s (California) two reactors are scheduled to be closed by 2022. The US could lose several more reactors over the next 10 years. The US also has at least 35 reactors that are 40 years old or older with several only short years behind. The decision will have to be made whether to spend the money to refurbish or close. Licenses have been extended but old stuff breaks so it is likely several of these plants will experience expensive repairs and will be closed. Not included in the list are the Japanese reactors which were shut down following Fukushima. Several/most of those reactors are not expected to return to service. And France is looking at closing several reactors. “France’s energy transition law could force state-controlled utility EDF to close up to a third of its 58 nuclear reactors by 2025, the state audit office said in its annual report on Wednesday. Fessenheim nuclear plant will be closed at the end of 2016. There was a near disaster in 2014 which was covered up by the nuclear industry but news leaked out in 2016 resulting in the plant’s closure. There are seven Spanish reactors whose license will have expired but no close/refurbish decision has yet been made. The nuclear industry has been losing market share for 20 years since its peak in 1996 and a decrease in number of plants for the last 10 years. It’s been a slow, drawn out death. But now with the immense drop in wind and solar costs we should expect the Grim Reaper to quicken his pace. To the extent the number that overlap with those reactors already losing money the decision will likely be to close. Here’s some new info I just now read. These graphs were created by a nuclear activist. Someone who is attempting to recruit people to advocate for more nuclear construction. 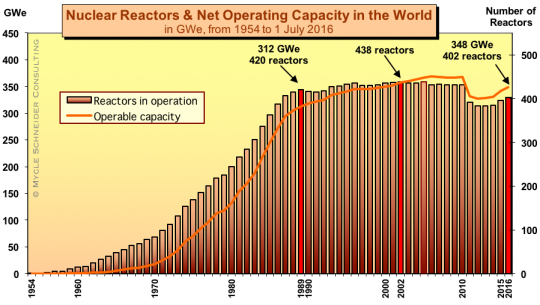 First a global summary of reactors closing and likely to close. And a summary of reactors under construction and ones that might be built. I haven’t checked his list, but some “under construction” reactors have been under construction for two decades or more. I don’t know if he counted these or not. I’d need to review his lists before I trust his numbers. Closures in the US by 2030 are likely to be much higher, IMO. Most of our current reactors will be 50 years old or older. Plus more reactors are likely to fall victim to the falling costs of wind and solar. Will China commit to more reactors post 2020? Will China’s government, which is very good at math, decide to spend more for less or will they move their money to renewables? 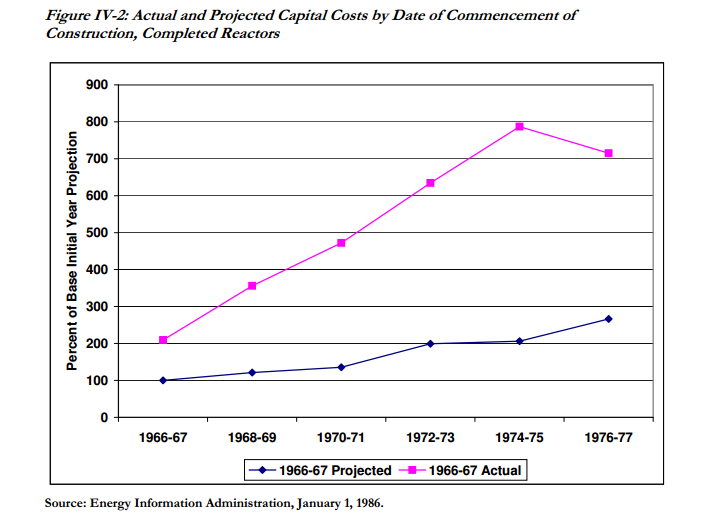 Will anyone finance the completion of the Vogtle and Summer reactors? Because households in Denmark and Germany are actually very energy-efficient with the newest technology and they really don’t care much about electricity prices (their average bill is in fact lower than in the US where they have lower rates but are much more wastefull), so a staggering 93% of Germans support the ongoing transition to renewable energy as they are well aware of the benefits over fossil fuels and nuclear at so little cost, especially as renewables reduce the wholesale electricity price so much that the industry and labou market is booming in Germany. The investment in renewables only went down, because renewables get cheaper so quick, last year actually saw the most renewable capacity ever installed in a single year, all while it was much cheaper than the year before. Because of China some nuclear plants are indeed getting built, but they don’t even compensate for all the nuclear plants that get shuttered all over the word, so the nuclear industry just continues to shrink globally. If you don’t believe me, read Michael Shellenberger’s (an all-in nuclear lobbyist, very much blind for love of nuclear) piece over on energypost.eu. You will like it, it is full of falshoods and baseless claims in favour of nuclear, but even he does not deny the basic fact that the number of nuclear plants is shrinking, and that as many as twice as much plants will be closed compared to the number of newly built. 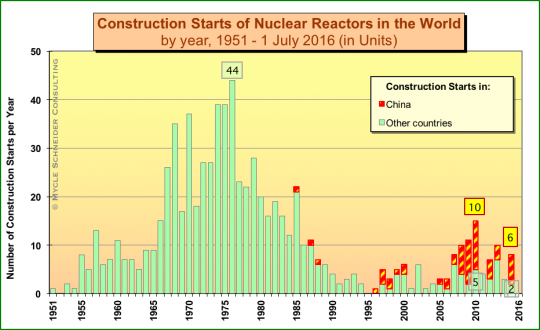 “Because of China some nuclear plants are indeed getting built, but they don’t even compensate for all the nuclear plants that get shuttered all over the word,” Lets do a check on those numbers. 33 plants were closed between 2010 and now most in Germany and Japan, few in the US and Russia. 46 Plants came online…….Thats 13 more plants coming online than were closed as of now. 10-18 are expected to come online this year to ad to that total. For the industry to be dying there should not be so many plants under construction and completed, especially not more than is beeing closed. As Mike Shelleberger he has tendency to be more bleak than the reality, he is also pretty blind to China, Russia and South Korea and continually ignoring their progress on costruction and especially on the R&D field. 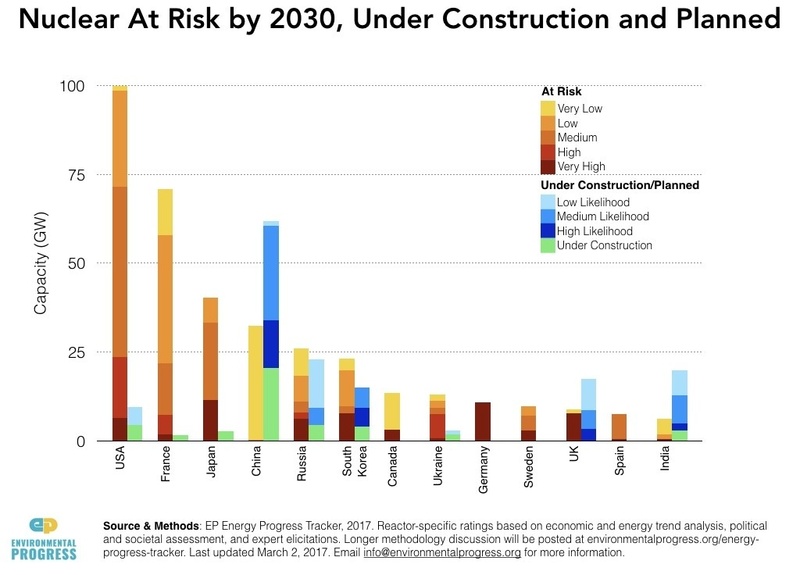 Lets not also forget that Mycle Schneider, a anti nukers favorite expert said in 2005 that we will never see more than 20 reactors under construction globally anytime in the future. We will also see a maximum of 1-3 reactors completed each year in the 2010s if even that and then the industry. He said in 2008 when no new construction began that: thats it nuclear is dead no new reactors we can all go home now. Then we come to the case of Jim Green the autohr of this article. He said in february in his article for the Ecologist( a site that makes greenpeace look credible) The following. “We may have been premature in declaring the nuclear renaissance dead. Indeed we’re right in the middle of the renaissance. It will likely span around three years and it will be more a dead cat bounce than a renaissance. Last year, 10 reactors were grid connected and four were permanently shut down. In 2017-18, the WNA anticipates 28 grid connections; the true number will fall short of that figure but grid connections will exceed permanent shut-downs.” This was February 2017. This is what he said in 2013. Pretty contradictory wouldn’t you say? Note the change of tone in the last few years, now its not dead, its just running out of steam. In a few years time he will be writing this nuclear building madness must end now, they are building too mcuh, help us stop it. Germany started supporting renewables when costs were still high. They did this with a feed in tariff for twenty years. This greatly accelerated the learning curve. For new systems the feed in tariff was regularly reduced. The feed-in-tarif was paid for by a surcharge per kWh. So electricty costumers today still pay for the early expensive systems. In 2020 these early expensive systems will start to drop from the FiT. 4) Large energy intensive industries are freed from the surcharge, increasing the burden on citizens. These industries often buy their power on the spot market where prices are pushed down by renewables. So effectively they get a subsidy. What a story! How the mighty have fallen. Perhaps a sequel about the nuclear waste problem. There is not one permanent storage facility for high grade nuclear waste in the world. Not one, not anywhere. Too bad people believe the propaganda. Nuclear is the only way to have ZERO emissions. Even Gas fired electric plants have carbon footprint. Too bad you don’t really know the facts. Analysis showed significant differences in water consumption, depending on the type of mining operation and particularly on the quality of the ore grade. This ranged from under 50 to over 8,000 KL/t U 3O8. Carbon dioxide emissions also varied from 10 to 50 t CO2/t U3O8 and there is a gradual increase of CO2 emissions over time. It takes about 200 tonnes of U3O8 per year to keep a large (1000 MWe) nuclear reactor running; mining and milling uranium to feed such a plant would, therefore, emit 2000-50000 t CO2 each year. This is similar to the total CO2 emission from the Falkland Islands in 2004. What do you mean by ZERO emissions? Carbon Dioxide is a benign emission compared to radioactive waste. That part is nasty, truly nasty and lasts far longer than the oldest pyramids or other ancient structures. No one knows where to put this most awful of products of consumption and it is stored temporarily at the nuclear power plants. This legacy is increasing every year and is not and probably cannot be addressed. Long after you, your house and your possessions have turned to dust , nuclear waste will be as fresh as ever, a hot potato handed from one generation to the next. “CO2 is benign compared to radioactive waste”? Last I checked, our CO2 emissions, if not unabated in a radical manner, will cause climate change that seemingly will end civilisation this century and cause an even more rapid reduction of biodiversity than is currently occurring. f) Probable triggering of tipping points such as carbon sinks becoming carbon sources, methane emissions from permafrost and or clathrates, ice sheet collapses and possibly other unknowns. A much greater legacy for future generations than the consequences of nuclear accidents or nuclear waste don’t you think Ian? Nuclear has a higher lifetime carbon footprint than do wind and solar. The subsidies might run out until then. 2019 was overly optimistic. ‘Testing’ is scheduled for 2020. But this first plasma creation won’t be self sustained, an atom reactor would supply the 500 MW necessary. Costs have tripled so far. German off-shore is far out, literally behind the horizon …. Shrug. A victory in “Greenmail” for the dumb watermelon bastards that support useless windmills. About 8% of the Australian population are stupid enough to think they are actually renewable, and that they can reliable generate power. Like the muppets in South Australia who now pay the second highest price for electricity in the world, and it also has the added advantage of shutting down on a regular basis. Yep all their gas is being sold overseas and interstate driving up the cost of the gas electricity. You did not read much articles on this site did you? EDF is the next on the block as the costs of delivering Hinkley C blow out. The low risk commodity nature of renewables is poison to the decade long paybacks, decade long construction times and billion dollar financing cost of nuclear. The pro/con environmental factors are pretty moot when the economics don’t stack up. It reflects very badly on energypost to publish falsehoods like those made in this article. It has been studied and shown in depth and time after time how the world, different continents, different countries, different regions, islands and even different cities can be powered reliably by 100% renewable electricity. To claim otherwise is just an obvious falsehood. Nuclear’s real problem is, that it is not competitive at all without massive direct and indirect subsidies and after sixty years people are tired of shoving any more money into this pit without improving any of its problems. Wide-scale renewable deployment has only started 17 years ago and right now wind and solar are already the cheapest electricity sources in many places while also being a no risk technology. The pace of the price of storage coming down mimics the radical cost improvements we have seen in pv, so it is just obvious to a lot of people (like those at the world bank) that a renewable energy system is the most competitive in a lot of places already and will be everywhere soon. France’s electricity is heavily subsidized and not at all a measure for the kWh cost of nuclear plants, which are heavily subsidized as well as are the government owned Areva and EDF which are constantly on the brink of bancruptcy. The costs to keep their aging nuclear fleet online are escalating quickly, the newly build are years later (if they ever get finished) and billions over budget, and they still haven’t solved the problem of storing the waste, at the same time their electricity supply nearly collapsed last winter because they had to temporarily shut down 13 nuclear plants because of security concerns over faulty steel for the pressure vessel. Dear Mr. Shellenberg, if you want to do nuclear any favour, start acknowledging the real problems nuclear has and then please quickly solve the cost, waste and risk problem. 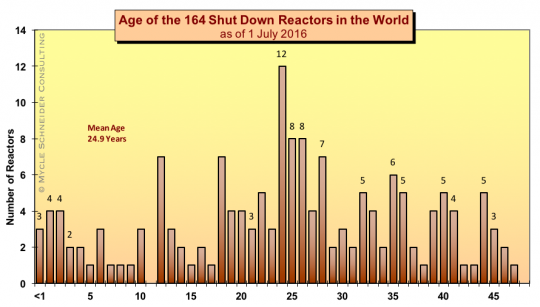 Now let’s look at the age of the world’s reactors. No more than 20% are less than 25 years old. The average lifespan for US reactors is about 40 years. That large group of 25+ year old reactors are not going to be around in 20 or so years. Finally, let’s look at how construction starts are running. Summary = not very fast. The world is not building reactors any rates even approaching what we did back in the heydays of nuclear construction. And there’s no reason to think that construction starts will increase. Renewables and storage have become incredibly competitive as costs have plummeted. The Chinese government is very good at math. I expect them to fade out their nuclear starts over the next few years and put their money in renewables.